Whether you’re moving into your first apartment out of college or you’re relocating to a new city for a job, moving into an apartment is a very exciting time! 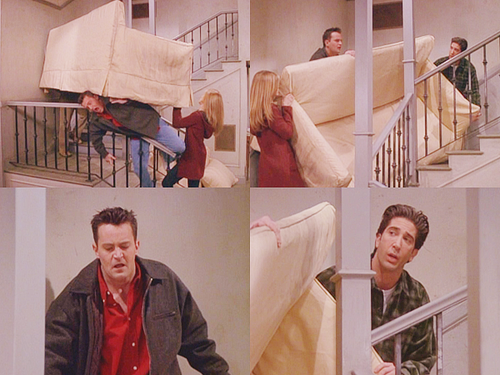 However, moving into an apartment presents some unique challenges—just imagine that scene from Friends: PIVOT! That’s why the moving pros here at SMARTBOX have compiled their best tips for moving into an apartment so you can get started without a hitch. Learn more about how SMARTBOX can help you with your moving and storage in MD, VA, and DC by giving us a call today—our number is 301-683-6111! Measure the rooms in your apartment before moving in! And we don’t just mean seeing how many shoe-lengths fit across the bedroom—get an actual tape measure and write down the measurements of the rooms. It’s also really beneficial to measure any doorways, hallways, or staircases you’re going to have to use to get to your apartment—some older apartments in the city may have much tighter stairways that you’re used to! The key to any successful move is to pack in advance—and we’ll keep telling you this tip until we’re blue in the face! The last thing you want to do is start randomly throwing things into boxes and bags at midnight the night before you move. With SMARTBOX, you can start packing as far as a month in advance by using one of our portable storage units. This gives you the time to pack carefully and thoughtfully, which helps decrease the chances of things being misplaced or damaged during your move. This is so, so important! Apartments can be cramped if you bring too many belongings, so only pack what’s going to fit. If you don’t have enough storage space in your apartment, you can use SMARTBOX to store your extra or seasonal belongings. In fact, this service works seamlessly with our moving services because we can bring multiple storage containers to you, and all you have to do is designate ones for storage and ones for your new apartment—we’ll take care of getting them to the right place. SMARTBOX will safely store your extra belongings in our temperature-controlled storage facility until you need them! Although your apartment should be clean upon arrival, if you want to give your new place a once over, the best time to do it is before you move in. This is also a great time to spray for any bugs or pests—especially if you’re moving into a city. If you’re purchasing furniture, make sure to do so in advance. There’s always a few days of lag time between when you purchase the furniture and when it is delivered, and you don’t want to be stuck in an empty apartment! You should also set up all your utilities before you arrive so everything will be ready once you get there. Contact us to reserve your boxes and move into your new apartment!